Collectors, start your engines. 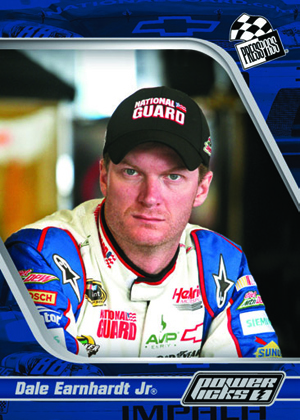 2013 Press Pass Racing kicks off another season of NASCAR trading cards. The company's flagship set promises a pair of memorabilia cards, a bundle of inserts and a ton of parallels in every hobby box. 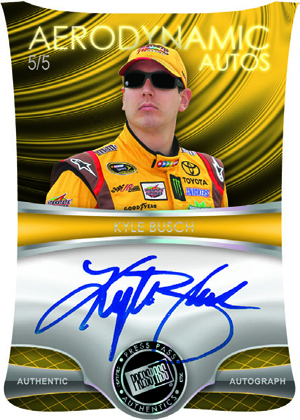 The 100-card base set features NASCAR's top racers. 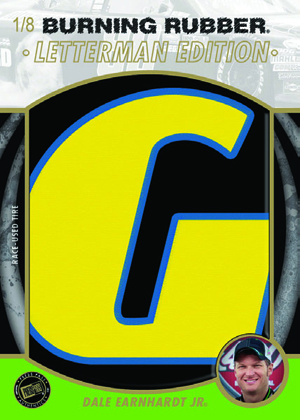 The set also has several levels of numbered and retail-exclusive color parallels. Every hobby box has 30 parallels, including one numbered to 35 or less. 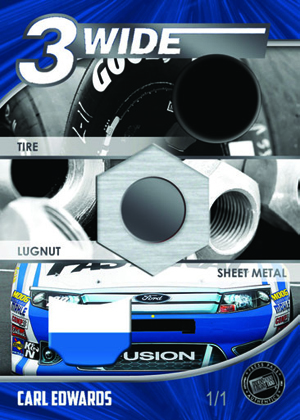 As with most of the company's sets, 2013 Press Pass Racing uses a wide assortment of race-used materials. They go well beyond the firesuits and gloves. 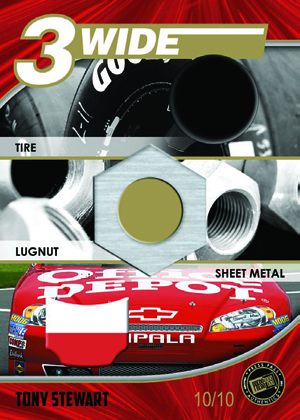 Collectors can look for cards that have pieces of tire rubber, sheet metal and even lug nuts. 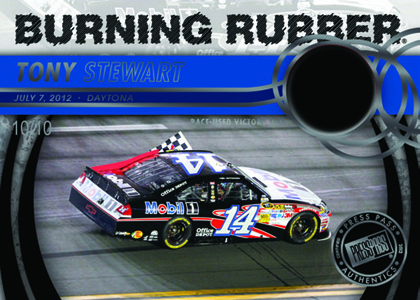 Burning Rubber includes victory tire swatches from various 2012 races. Burning Rubber Letterman switches to a vertical design and are decked out with the tire manufacturer letters. Three Wide and Four Wide highlight multiple memorabilia pieces. Numbered parallels add to the memorabilia card chase. 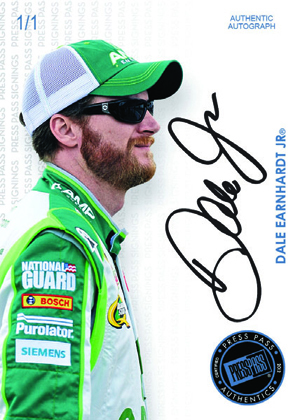 Every third box of 2013 Press Pass Racing has an autograph. 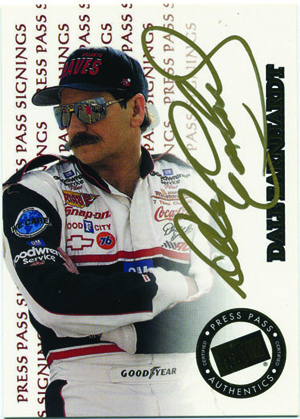 Press Pass Signings return with the set's 1999 design. 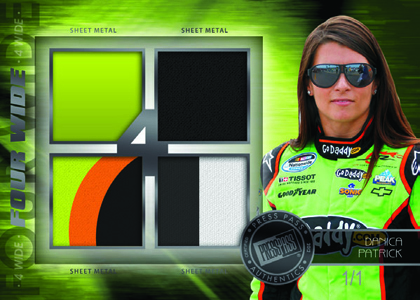 Cards are available in five different levels, including Printing Plates. New Aerodynamic Autos are done with a sleek die-cut design. 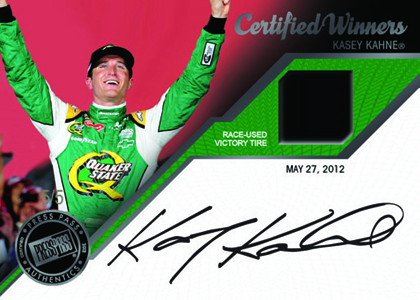 Certified Winners have on-card signatures and race-used tire pieces from those who took the checkered flag in 2012. 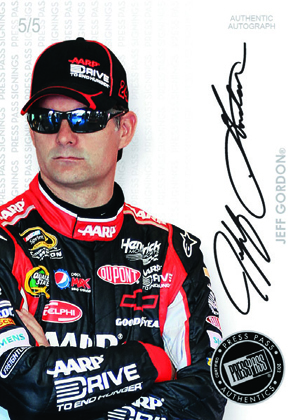 Similarly, Signature Series Autographed Memorabilia cards mix autographs and pieces of race-used equipment. 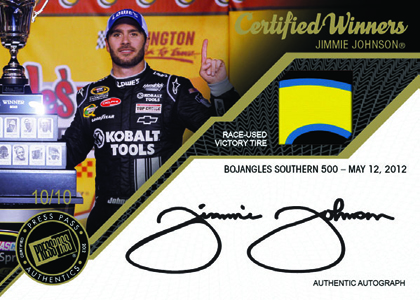 Every half case of ten boxes has a high-end autograph from either Dale Earnhardt Jr, Jeff Gordon, Jimmie Johnson, Danica Patrick, Tony Stewart, Carl Edwards, Kyle Busch or Travis Pastrana. Every half case also has a hot box that comes with an autographed memorabilia card, two memorabilia cards and at least one Yellow Press Proof numbered to 5. 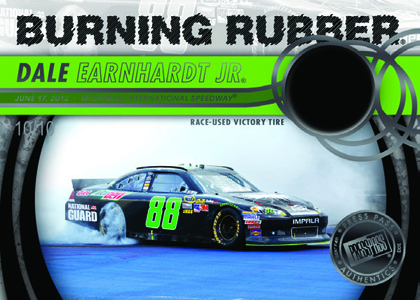 Bonus Power Packs, available to hobby shops, come with exclusive Power Picks cards as well as other special inserts. These include Press Pass Signings buybacks.